I could live on tomatoes. I don’t know what is in those juicy, red, delicious things… but I love them. 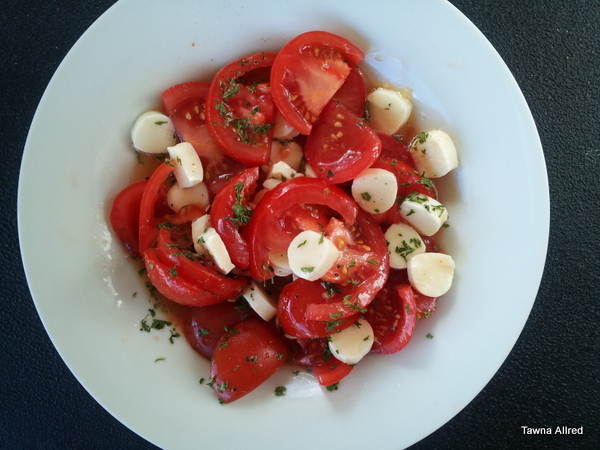 I recently started eating a simple salad made with tomatoes and Mozzarella cheese almost every day. It’s somewhere in between my pasta salad and bruschetta. Simple and savory, it is a perfect “go-to” when you need a side dish in a hurry. I hope you enjoy it as much as I do. Combine everything into a small bowl. Drizzle desired amount of Italian dressing over everything. Devour.